While members of both parties want to know more, they defer to Special Counsel Robert Mueller on the question of any charges against the president. Former FBI Director James Comey’s testimony Thursday about possible obstruction of justice by President Trump prompted calls from Democrats and Republicans for an expansion of ongoing probes examining the actions of other senior administration officials. Democrats said they’re especially eager to examine the roles played in Comey’s firing by Attorney General Jeff Sessions and Deputy Attorney General Rod Rosenstein. And members of both parties said they want copies of memos and other documents Comey said he has turned over to Special Counsel Robert Mueller, detailing his interactions with the president. 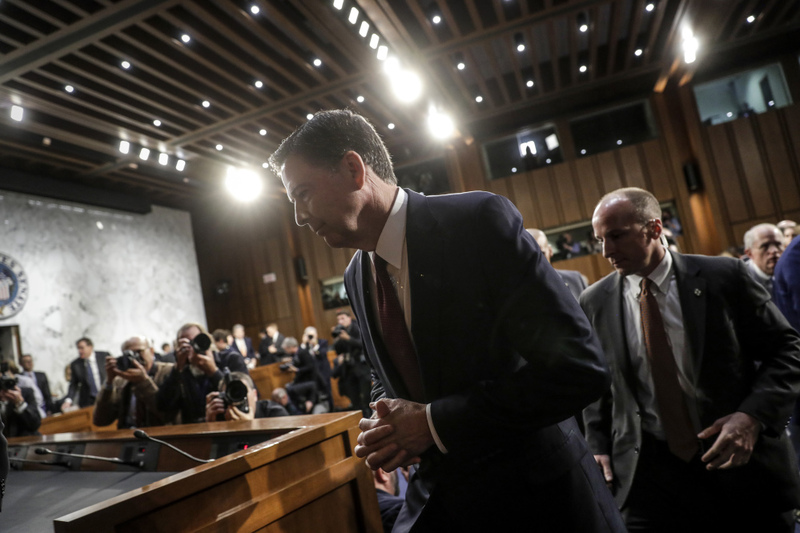 Nearly three hours of testimony by Comey – in which he detailed his interactions with Trump before his firing May 9 – raised the prospect of new lines of inquiry for at least four Senate and House committees looking into various aspects of the matter. It also suggested that principal characters in the drama, like Sessions, are likely to face pointed questions from Democrats when they come to Capitol Hill for other business. Sessions is scheduled to appear Tuesday before a Senate Appropriations subcommittee to discuss the Justice Department’s budget. Comey’s testimony left some lawmakers wanting more. “Every good movie has a sequel,” quipped Sen. Lindsey Graham, R-S.C., who first came to national attention as a House lawmaker involved in former President Bill Clinton’s impeachment trial. Some Democratic senators reacted to Comey’s testimony by saying they believe there is credible evidence that Trump may have obstructed justice in trying to convince Comey to drop the FBI probe into former national security adviser Michael Flynn. But they cautioned that it will be up to Mueller to present such charges to Congress. “Everybody wants to jump to a conclusion – we’re nowhere near a conclusion,” said Sen. Dianne Feinstein, D-Calif. Precedent dictates that a sitting president won’t be indicted on obstruction of justice charges, according to legal experts. Congress must ultimately determine if matters raise the specter of impeachment. “The evidence just keeps piling up that there has been a very real presidential abuse of power,” said Sen. Ron Wyden, D-Ore., a senior member of the Intelligence Committee. But when asked whether Trump’s actions amounted to obstruction of justice, he deferred to Mueller and his legal team. “I’ll leave the lawyers to make those decisions,” added Sen. Mark Warner, D-Va., the Intelligence Committee’s top Democrat. Comey did not say that he believed Trump’s conversations with him were an effort to obstruct justice. But his narration of events – that Trump made a point of speaking with him alone and pressured him to drop the Flynn investigation – suggested that if they didn’t amount to obstruction of justice, they certainly came close. There is “certainly a building, mounting, unfolding case of obstruction of justice” against the president, said Sen. Richard Blumenthal, D-Conn.
“Whether it rises to criminality … I’m not prepared to reach a conclusion on that because we’re not done with all the other pieces that are missing,” said Sen. Marco Rubio R-Fla., an Intelligence Committee member, after the hearing. Rubio said that the committee had yet to hear a full accounting from Director of National Intelligence Daniel Coats or Adm. Mike Rogers, head of the National Security Agency, about whether Trump also asked them to pressure Comey to drop the FBI’s probe. Coats and Rogers appeared before the intelligence panel Wednesday, but refused to answer questions about their conversations with Trump or Comey – leading Burr to warn them that “at no time should you be in a position where you come to Congress without an answer” to questions. That line or argument – that Trump is a first-time politician worthy of leeway and understanding – was repeated across Capitol Hill on Thursday by senior Republicans. Blumenthal and Graham are members of the Senate Judiciary Committee, which has pushed to have Comey appear to answer more questions about his interactions with Trump and other senior officials. But aides and senators said it may be difficult to compel Comey, now a private citizen, to return for more questions – this time from a panel packed with former federal prosecutors and state attorneys general whose queries may be more pointed. A spokesman for Senate Judiciary Chairman Charles Grassley, R-Iowa, didn’t return requests for comment. The future work of the Senate Intelligence Committee, regarded across Capitol Hill as the most studious and advanced congressional probe, may be determined in large part by a meeting leaders will have with Mueller next week. The committee is also sorting through some documents that Flynn provided in response to subpoenas for his business and personal records. Flynn has also provided some documents to the House Intelligence Committee in response to a subpoena, according to that panel’s ranking member, Adam Schiff, D-Calif. Both Burr and Schiff have indicated that more subpoenas may be coming in their respective probes. Burr also said earlier this week that the committee will soon issue more subpoenas for witnesses’ documents. In the House, members are still waiting on a response to subpoenas issued for documents and testimony from Flynn and Trump lawyer Michael Cohen. In the House, aides to the chairmen of the Intelligence, Judiciary, Oversight and Government Reform Committees said they had nothing to say about whether Comey’s testimony might reshape their investigations. The House Judiciary Committee has said it will conduct oversight of Mueller’s probe but has no plans for a fresh inquiry. Graham warned that any expansion of the controversies swirling around Trump will likely lead to more political fallout. He recalled how initial investigations of Clinton’s involvement with the Whitewater land deal led to revelations of his extramarital affair with a White House intern.